Yesterday, I happened to be in Exeter, Devon. Fortunately, Exeter has an Apple Store, and I always like have a peek inside. Apple really know how to merchandise their products properly. It is always a pleasure to browse and admire the Apple hardware and accessories. This time however, I was shopping for a new Apple Watch strap for my wife. Her strap needed replacing. A few months ago, I had bought a red leather third party strap. The good news is that at the time of purchase it looked rather nice, but the bad news is that its worn rather poorly and started to cause skin irritations on my wife’s wrist. This time my wife wanted an official Apple Watch strap to avoid the pitfalls of the third party strap experience. Apparently, according to the sales person in Apple Exeter store there are a total of 52 different official Apple Watch strap combinations. Two straps caught my wife’s attention. The royal blue woven nylon strap and the mint sport band. The woven nylon strap looks considerably better on the wrist than off. 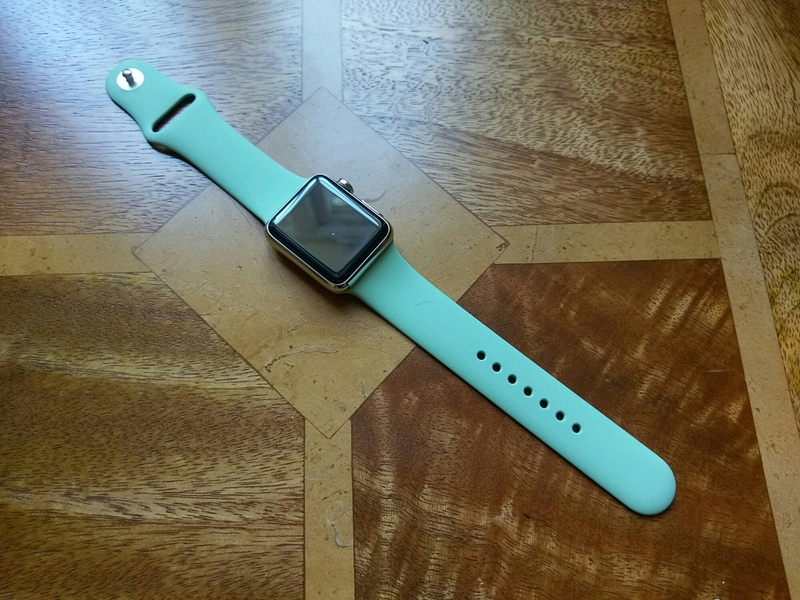 However, in the end the mint sport band was my wife’s favourite. Plus she liked the fact there was a matching mint Apple case for her iPhone 6S. Photo above of mint band. Payment was via Apple Pay which when used for payment inside the Apple Store is not capped in transaction value. Will be good to see a picture. Sure. I’ll add one later.